Beef Stir Fry Recipe - Beef Cooked In Black Bean Sauce. 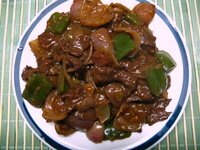 Beef Stir Fry Recipe - A Chinese beef recipe cooked in black bean sauce. This Chinese beef stir fry recipe is very easy and simple to prepare. The benefit of Chinese cooking is that most of the nutrients in the vegetables are retained. The flavors are absolutely amazing. Try it just once, you will definitely like it. Marinate the beef slices in the marinade for at least 30 minutes. Chop the other vegetables as mentioned. Heat a pan and roast the marinated beef (without adding any oil) for at least 5-7 minutes. Take the slices out on a plate and in the same pan add a tablespoon of oil. Add the chopped ginger and garlic, followed by the chopped spring onion bulbs (not the shoots) and the green chili. Saute a little and put the beef back in. Add the sesame oil, black bean sauce, stock cube, pepper, oyster sauce and red vinegar. Now add onion shells and cook with the beef till they become glassy. When the beef is nearly cooked to your taste (I like it well done), add the green bell pepper (capsicum). Cook for 2 more minutes. Sneak a taste and add salt if required. Now add the cornflor paste and cook another 30 seconds till the sauce thickens (whatever little sauce is there, mostly this is a dry recipe). Turn off the heat and sprinkle with the chopped spring onions. Serve hot with boiled rice or noodles.